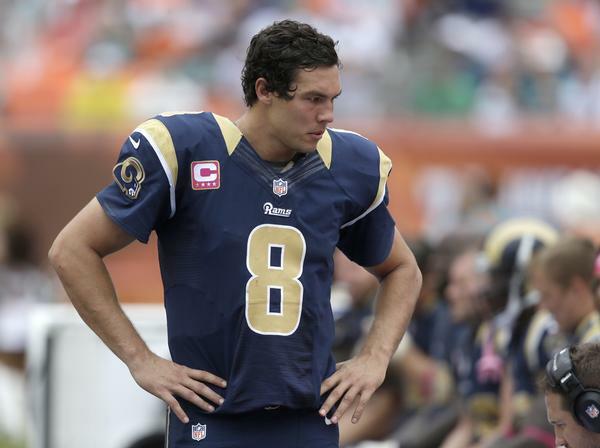 Falling Star: Sam Bradford on trading block? After bring the first pick in the 2010 NFL Draft it looked like Sam Bradford was poised to be the Rams’ franchise quarterback. After signing the largest rookie deal in league history, $78 million dollars over six years, Bradford backed this up by winning the NFL Rookie of the Year in 2010. However, in the spring of 2014, the Rams maybe looking to move their franchise quarterback and Draft his replacement in the upcoming draft. When healthy, there is no question that Bradford is a talented quarterback, but injury issues and his massive contract may have become to large of a burden for St. Louis to bear. With $27 million dollars owed over the next two seasons in guaranteed money, it’s hard for the Rams to have faith in Bradford’s health. In the Rams last 48 games, Bradford has only started 33 of those games. With the Rams culminating a plethora of young talent the past three off seasons, they could be just a quarterback away from competing in the talented NFC West. Sources from Rams camp have said this week that the club is looking to trade Bradford and that St. Louis is seriously considering taking Johnny Manziel with their number 2 pick. While this may seem high, there has also been talks that the Rams could also wait at pick 13 in the hopes that Manziel or Bortles could fall to them. While this is a plausible scenario, the big question is can the Rams trade Bradford and will there be a market for him? There are teams that are desperately looking for quarterbacks, but the Rams will probably not get a high return on Bradford because of his injury history and contract. Even if the Rams agree to swallow a significant portion of the contract, they still at best would fetch maybe a mid round selection or two for Bradford. I propose that the Rams keep Bradford and draft a quarterback. In that scenario you get a talented backup to Bradford who can sit and learn while Bradford can hopefully stay healthy. If he gets hurt, then the Rams have a viable backup to take over. If Bradford plays all, then he will be easier to trade and command a higher value after next offseason. Worst case scenario, Bradford is terrible or hurt, and the Rams go their first round quarterback to take over. While there is still a lot that can happen before the Draft, this is one story we will have to keep our eyes on.